We would first like to thank you for your interest in Whitewater Excitement. We pride ourselves in running some of the most popular and certainly best river trips in the state. 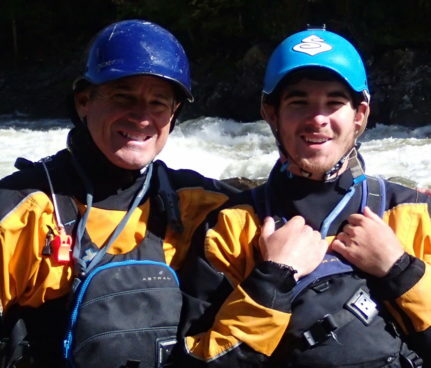 We consider ourselves a leader in California Whitewater rafting and have the leadership and commitment remain the premier river outfitter certainly for years to come. We invite all applicants to explore our web site in order to learn more about us at WWE. Our facilities are simply unmatched, warehouses and equipment are the best in the industry, and we pride ourselves on continually improving our working conditions. This all combines to make working with us the ideal spring and summer experience. We are looking for folks that will be able to work for more than one season. Working one season and moving on to something or somewhere else is just not what we are looking for. We invest a lot of time, energy and finances with our new guides and guide school to have folks not build up with us. We only hire self – starting, motivated, team players who prove themselves dedicated to the overall picture of providing the best customer service possible. You need to be prepared to live, play and work with our team. WWE’s rafting season begins early in April and finishes up in the end of September. Our peak season, however, tends to begin in the first week of June and lasts through to Labor day weekend. 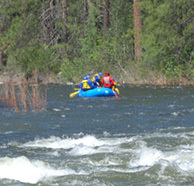 Our North Fork of the American Class 4 trips, as well as the Merced River trips begin in early April. Qualified applicants are required to be here no later than the beginning of May. 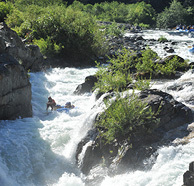 For applicants with no prior commercial rafting experience, we offer whitewater guide schools. Call us for this year’s dates. Our guide schools will teach you more than just whitewater guiding, but we also gear these students towards hopefully working for us specifically. Our staff is paid on a per trip basis that also works on seniority. First year guides will hope to earn approximately $70 for each half day trip and upwards of $100 for every full day trip. Experienced Class 4 guides will hope to earn anywhere from $80 to $120 a day, commensurate with both experience and qualifications in addition to certifications ( EMT or Paramedic, commercial class B drivers license, Swift Water Rescue, Interpretive teaching skills). We offer our guides a place to live for the duration of the season at our South Fork American Base camp. This is tent living, however we do have bathrooms equipped with flush toilets and hot showers. Meals are included as follows: lunch if provided on all one day trips, breakfast, lunch and dinner in included in multi – day trips. If you already are an experienced commercial guide and interested in working with us, please download the Guide School / Job Application form, fill it out, and e-mail it back to [email protected] and he will contact you about possible openings for the upcoming season. Those of you who do not have any commercial guiding experience, but are still interested in working with us, check out our two-whitewater guide schools (below). We hire our new guides right out of our schools. The gear that our guides will need to have include dry or wet suit with insulating layers, helmet, paddle jacket, life jacket, proper shoes, straps, carabineers, throw bag, and stuff or duffel bag. If you are attending our guide school, do not worry about getting all of this before hand. We have equipment for you to use and will go over the proper gear during the school. If you would like more information or have any questions at all, please give me a call at (916) 888- 6515 or leave a e-mail message. Thank you once again and I look forward to hearing from you! PLEASE FILL OUT APPLICATION AND PHILLIP WILL GET BACK TO YOU ASAP. How many years do you plan to be a river guide? Do you play a musical instrument? Yes No ... If so, what kind? Do you have a car? Yes No ... If so, what kind? Do you understand that rafting is a job and is very demanding both mentally and physically? Are you capable of handling a demanding, intensive, physical workload from the start of your contract to the end? ... If yes, can someone care for it during the season? Do you understand that you are not guaranteed a job by Whitewater Excitement ? IF SENDING THIS APPLICATION THROUGH THE MAIL, ATTACH RESUME OR OTHER REFERENCES IF AVAILABLE. You will be notified if there is space available in the school you have chosen. Whitewater Excitement each year offers a whitewater guide school, which is where we seek prospective employees. This school is only for individuals with a desire to work for us during the spring and summer season, and years to come! We have the tradition of hiring all of our employees from our school. For more information on working with us, call our office at 1-800-750-2386 or download, fill out, and e-mail back our Guide School Application Form. If you have no guiding experience, but would much like to work with us, then our school is the ideal place for you. Our school are designed for us by us and geared specifically for guides that will work for WWE. 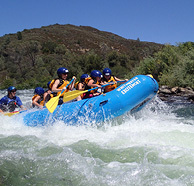 During our guide school you will learn all there is to know about guiding a raft with commercial passengers through some of the best whitewater in California, and proper use of all our equipment. We will also teach you about the river; its history, flora and fauna, and the wildlife that inhabits the area. Wilderness cooking and camping is covered as well as swift water rescue techniques. All throughout our school we will teach our students the Whitewater Excitement method of doing things. This includes preparing meals and equipment to making sure that our guests are happy. We have a detailed workshop on customer service workshop during our spring course that really gets how we see our guests needs. If you are interested in attending our Guide School and becoming an elite Whitewater Excitement Rafting Guide, please fill Download the Guide School Application form, and we will contact you about possible openings for the upcoming season. The Summer school begins on the first or second Sunday in June and lasts 6 Days. Most days will see that the meals are included; however certain meals will be left to the participant. The majority of the school we will stay on the South Fork of the American River, this is the river that the majority of our first year guides work on. We do try to spice things up a bit when we spend a day or two on the Middle or North Forks of the American, depending on the weather and water levels. Camping will be provided at our South Fork Basecamp. Please call for dates or if you need more information. In order to qualify for our guide schools you must be; minimum 18 years old( or have Phillip’s consent if under 18), seeking employment with us this spring and summer, must bring with you a professional and open attitude. In addition to this, keep in mind that you will be required to often work long hours without being particularly prone to moodiness or burnout. You must also be able to live, work, and play with others as a team player, as well as being able to accept directions on the Whitewater Excitement way of doing things. We are always looking for folks who love to share their experiences and the river with others, and who are fully able to place guests needs above their own. We are looking for folks that will be able to work for more than one season. Working one season and moving on to something or somewhere else is just not what we are looking for. We invest a lot of time, energy and finances with our new guides and guide school to have folks not build up with us. Students will need the following equipment for the schools, river equipment, which includes a dry or wet or dry suit considering that the school is not weather dependents. Pile, wool or poly – pro undergarments, wet suit booties, swim suit or, sunglasses with retaining strap ,hat, lip balm and sunscreen, water bottle, rain pants and jacket. You will also need camping equipment including warm clothes (shirts, pants, socks, shoes, jacket) sleeping bag and ground pad, tent, toiletries, flashlight, alarm clock, drinks and snacks while on your own time. Tuition for the guide schools is $400.00 ($300 for students*). We accept payments through the following methods, $200.00 deposit in order to secure your place, and the remaining $200.00 prior to the first day of the school. *College or High School students will receive a $100 discount off the $400 tuition. If you are interested, give us a call at (530) 888-6515 to reserve your space or to get more information. We do limit the number of participants. Upon receipt of your deposit, we will send you out the complete guide school manual and information packet.